One of the most beautiful motorcycle loops in the world can be found in the northwest of Slovenia. The Southern Limestone Alps stretch from northeastern Italy into Slovenia where the Julian Alps rise up into the heavens. There are many peaks reaching over 8,000ft, but the centerpiece is Mount Triglav, which is the highest peak in Slovenia and the former Yugoslavia. Much of the Julian Alps are included in Triglav National Park. Incredible mountain passes, beautiful clear lakes, tropical-blue rivers, lush forests, waterfalls, snow covered craggy peaks, and cute villages are all connected via an amazing loop of hair-pin turns and perfect motorcycle roads. In a few days you can experience some of the most beautiful nature in Europe. I took three days to do it, staying in Bled and Bovec overnight. I made my way up to the Julian Alps from the family homestead in southern Slovenia. Along the way is Predjama Castle. A renaissance castle that was built into the mouth of a cave. Central Slovenia is made up of green rolling hills and small peaks. Tiny villages of orange tile-roofed houses are tucked in small valleys surrounded by colorful meadows. From the south, in Zgornja Sorica, you can go over a pass that will lead you to Bohinjska Bistrica and Lake Bohinj close by. A short ride to the northeast takes you to beautiful Lake Bled. The blue waters sit tucked between snowy mountain peaks with a small island in the middle that is home to a church. There’s also Bled Castle, which towers over the lakes shore. Sunsets are a magical time at the lake, and the colors change and morph until darkness sets in. Before starting the loop north, I went back to Bohinj Lake and up to Savica Waterfall. If you just stay on the main road going past the lake, eventually you get to the trailhead for a short hike that’s well worth it. Back down the valley, the early morning for slowly dissipated. The gorgeous Bohinj Lake is the largest in Slovenia, and home to an abundance of wildlife. Along the shores, you can watch schools of brown trout swimming underneath the ducks. The flat waters give amazing reflections of the surrounding landscape. 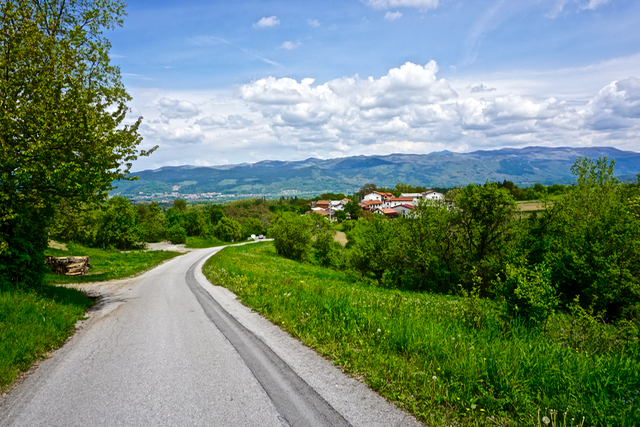 On the way back towards bled, it’s worth riding some of the single lane roads through the villages. Life moves at a slower pace around here. From Bled, instead of getting on the main road north, take the smaller country road to the west. It’s a beautiful ride that you don’t have to share with many other people. As you make your way northwest, montain peaks begin to show themselves and the landscape gets more dramatic. Around the top part of the loop catch the Triglavska Cestra road, which takes you south towards the base of Mount Triglav. Before getting there you will have to park and take a hike, but it’s very much worth it. The trail leads you face to face with the highest mountain in Slovenia and gives amazing views all the way down the valley. Back on the main road, continuing west, you ride along craggy snowy peaks and lush forests. Slovenia has some really nice pine forests. In Kranjska Gora you head south to go over the Vršič Pass, which is the highest in Slovenia and the route to the Soča Valley. I got lucky and caught it on it’s first day re-opened after a snow storm closed it down. As I began twisting my way towards the top and out of the Sava Valley, the clouds started lifting and thinning out. Eventually the impressive limestone peaks appeared all around me. It’s one of the prettiest roads I’ve ridden. By the time I reached the top, I was lucky enough to experience this. Fifty hair-pin turns lead up and over the pass and deliver you into the Soča Valley and the village of Trenta sitting wedged between the mountains. Traveling towards Bovec, you get your first views of the incredible tropical blue water of the Soča River. Just outside Bovec, to the south, is a forest road you can ride up for some amazing views of the valley. From Čezsoča, the gravel road traverses up towards Mount Polovnik. After less than five km, you will reach this point. The Soča River Valley is a special place full of places to be explored. Across the small suspension bridge, where the kayak photos were taken, is an old bunker from the Austro-Hungarians in World War I. You can go down into it’s guts and explore. From Bovec, another ride to do is to the north. This will take you to the Italian border as well as Mangart road. Mangart road heads up towards Mount Mangart, and is the highest road in Slovenia (going over 2,000 meters). Unfortunately, I couldn’t make it all the way because the road was blocked with snow and ice, but still a nice peak at it. Since Italy and Slovenia are both European Union countries, there is no border control, so there’s no reason not to ride down to the beautiful Predil Lake. If you’re in the mood for some exploring, try any small side roads that lead towards mountain peaks. You will never be disappointed. Not too long after leaving Bovec and heading south, you will find the trailhead for Boka Waterfall, which is the highest in Slovenia. The viewpoint is a ways away, but in person it’s magnificent. As I made my way down the trail and back to my bake, the rain turned from drizzle to full-on rain, which sent me riding south and out of the mountains as quickly as I could. A beautiful loop of Triglav National Park and the Julian Alps before riding back south and returning to Studena Gora. Not a bad place to return to. This entry was posted in adventure travel, attractions, Motorcycle world travel, Photography, slovenia travel and tagged best route, bohinjsko, bovec, julian alps, lake, lake bled, loop, motorcycle ride, mountains, national park, photography, slovenia, soca river, travel, triglav. Bookmark the permalink.